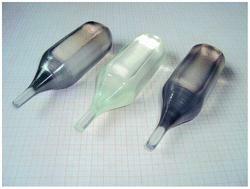 This month’s selection is wine bottled shaped single crystals of CaWO4. Grown by a team working on the CRESST dark matter detection project, these high-purity scintillating CaWO4 single crystals are used as detectors for Weakly Interacting Massive Particles (WIMPs), which are one of the best candidates for dark matter. To detect the elusive WIMPs, these crystals have to be of a very high purity and have fairly similar weights (approx. 300g). The high melting temperature (around 1600oC) of the crystal, as well as the fact that it has to be grown in an atmosphere containing oxygen, provided additional challenges to the growth process. Find out more about the use of CaWO4 crystals in the dark matter experiment, and learn how to grow your own CaWO4 wine bottles from the article, which is free to access for 4 weeks. 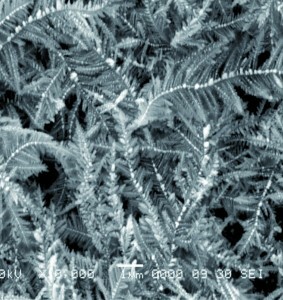 Last month’s crystal clear is a wintry image of a Cu2O crystal. 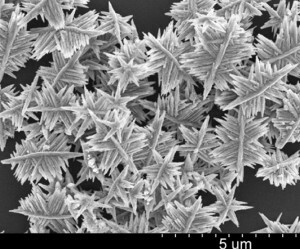 The group from the Taiyuan University of Technology were investigating the growth of Cu2O crystals along the <110> direction. Copper(I) oxide is a p-type semi-conductor with applications from solar-cells to water splitting and catalysis. The physical properties of Cu2O crystals are greatly influenced by their morphology, which has generated considerable interested among crystal engineers. The study by Wei Liang et al. 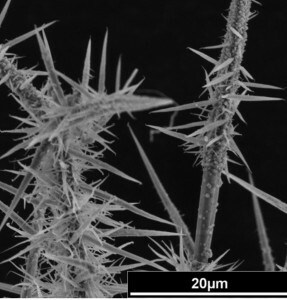 reports the synthesis of dendritic crystals using a pulsed galvanostatic method and an electrolyte containing only Cu(Ac)2, the controlled growth along the <110> directions produces these eye-catching nano-structures. The team reported the full details of their research in Issue 23 of CrystEngComm. You can download the full article below, which is free to access for 4 weeks. 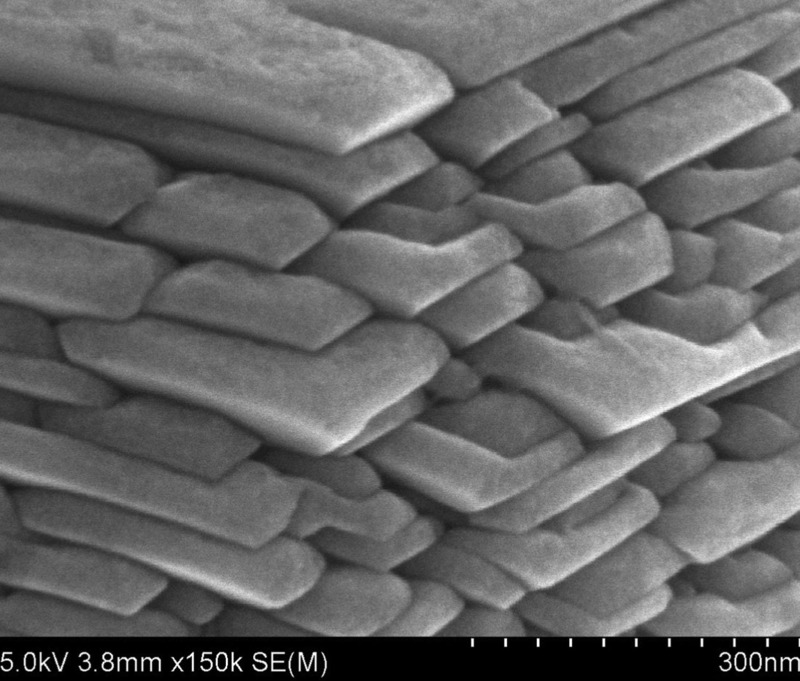 Are you a budding crystal engineer? Keep up to date with latest developments by following us on twitter @CrystEngComm. Mid-infrared lasers are of particular interest for a variety of applications including sensing, defence applications and laser surgery tools such as the laser scalpel. This month’s crystal clear is a very bright image of a CaErAlO4 crystal. The team from the Fujian Institute of Research on the Structure of Matter, Chinese Academy of Sciences, led by Professor Chaoyang Tu have been investigating new materials for mid-infrared lasers. Lasers in this range of the spectrum are of particular interest for a variety of applications including sensing, defence applications such as heat seeking missile counter measures and laser surgery tools such as the laser scalpel. 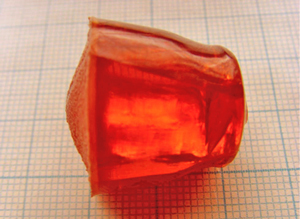 The crystal was successfully grown using the Czochralski method and the absorption and emission properties compared to those of existing InGaAs laser diodes and Er:YAG lasers. For more details on the team’s research findings, including the photochemical properties and crystal structure, you can read the full article which was published in Issue 21 of CrystEngComm. This month’s crystal clear is a barium borate crystal. Inorganic borates are of interest due to their physical properties in the ultraviolet range of the electromagnetic spectrum, making them potentially useful materials in non-linear optics. 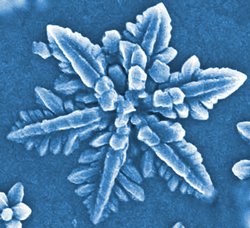 The image is of a crystal created by T. B. Bekker et al from the Siberian Branch of Russian Academy of Sciences and published in Issue 20 of CrystEngComm. The team were studying the BaB2O4–BaF2–BaO system and discovered the new non-centrosymmetric solid-solution series Ba7(BO3)4−xF2+3x. For more information on the group’s discoveries you can download the full paper which is free to access for 4 weeks. This month’s crystal clear is a striking image of what looks like a crystal flower! In fact this is a high-magnification SEM image of a ZnO microstructure prepared on indium-doped tin oxide (ITO) glass. Ping Yang and co-workers from the University of Jinan published their article in Issue 18 of CrystEngComm. 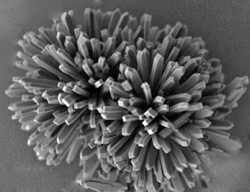 The team were investigating the growth mechanism of ZnO rods using an environmentally friendly synthesis at 70oC, by decreasing the concentration of NaOH they found they could transform the rods into these remarkable flower-like structures! You can read the full details of the groups research, including how to create these impressive crystals, by downloading there article below, which is free to access for 4 weeks! This month’s crystal clear looks decidedly like a hedgehog! 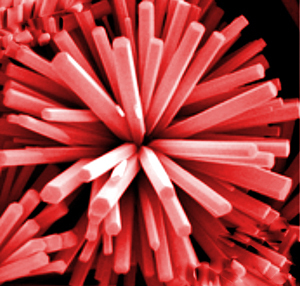 In fact this is a BaSO4 particle grown using H2O2 to control particle morphology. Published in Issue 16 of CrystEngComm the paper describes the growth of BaSO4 crystals and proposes an interesting growth mechanism via selective adsorption of intermediates HO2–, O22- and O2, generated from the decomposition of hydrogen peroxide during the reaction. 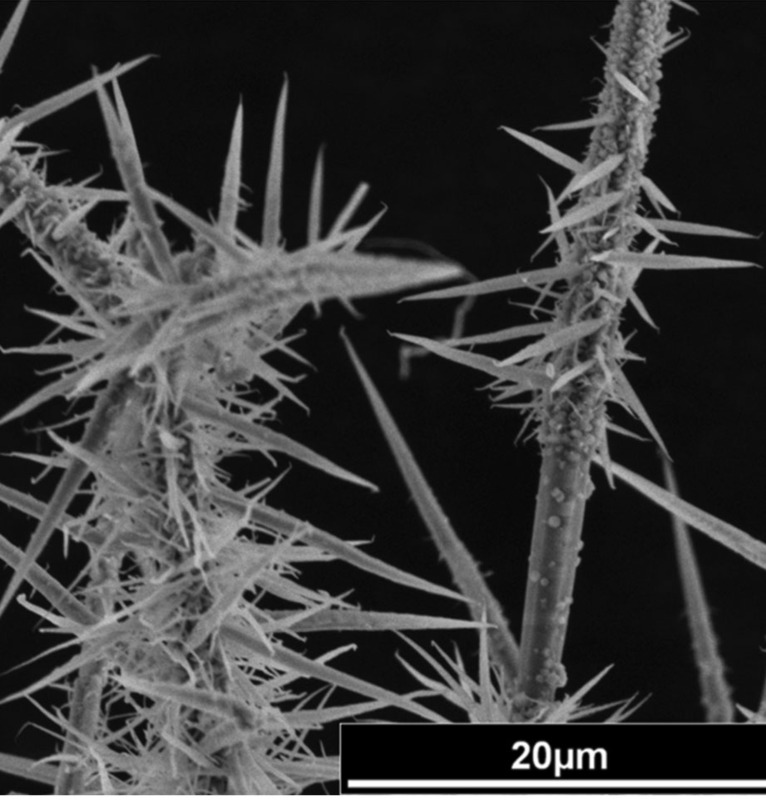 The team from the Institute of Chemistry, Chinese Academy of Sciences were looking to control the morphology of barite without affecting crystal purity. Barite is a material with a wide range of applications, the largest being in drilling fluids (used during oil and gas exploration) and also as a paint and plastic additive as well as application in medicine. By changing the concentration of H2O2 and varying reaction pH the team were able to control crystal morphology. 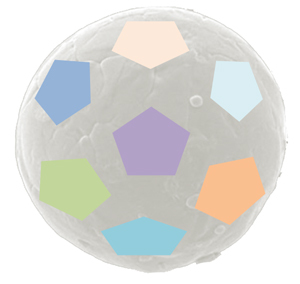 Download the article for free to find out how the team achieved the shape control and see their SEM images revealing the growth of the structures. 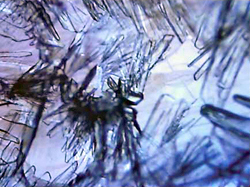 An image taken through an optical microscope of L-arginine acetate grown using a 'Metal-Assisted and Microwave-Accelerated Evaporative Crystallization’ process. The beautiful image in this month’s crystal clear isn’t actually a crystal cavern. 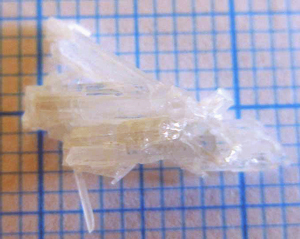 It is crystals of L-arginine acetate grown using a new crystallisation technique. The crystals are of particular interest in non-linear optics given their second harmonic generation properties. The Aslan Research Group have developed a new crystallisation method to grow L-arginine acetate crystals much faster than the previously reported cooling/evaporation method. 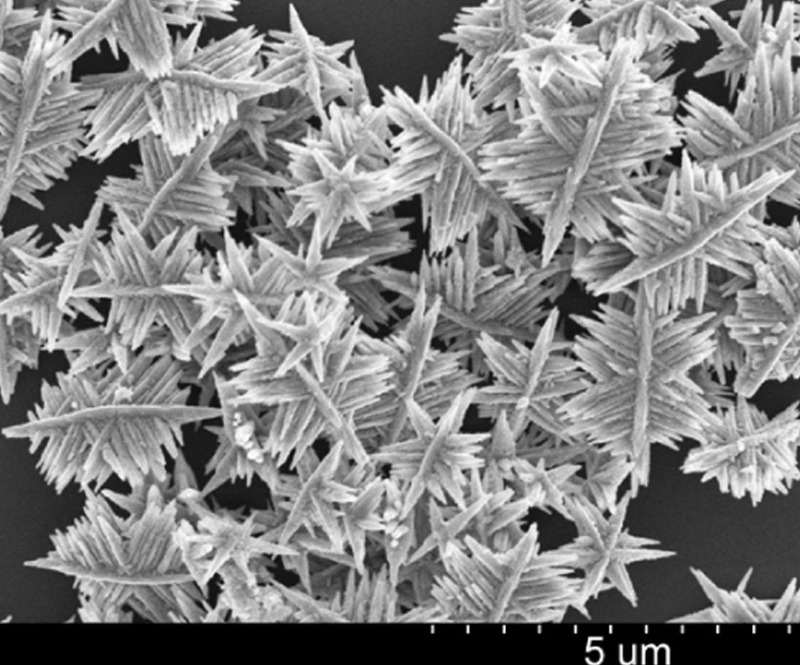 The ‘Metal-Assisted and Microwave-Accelerated Evaporative Crystallization’ process uses silver island films and low power microwave heating to grow the crystals quickly. 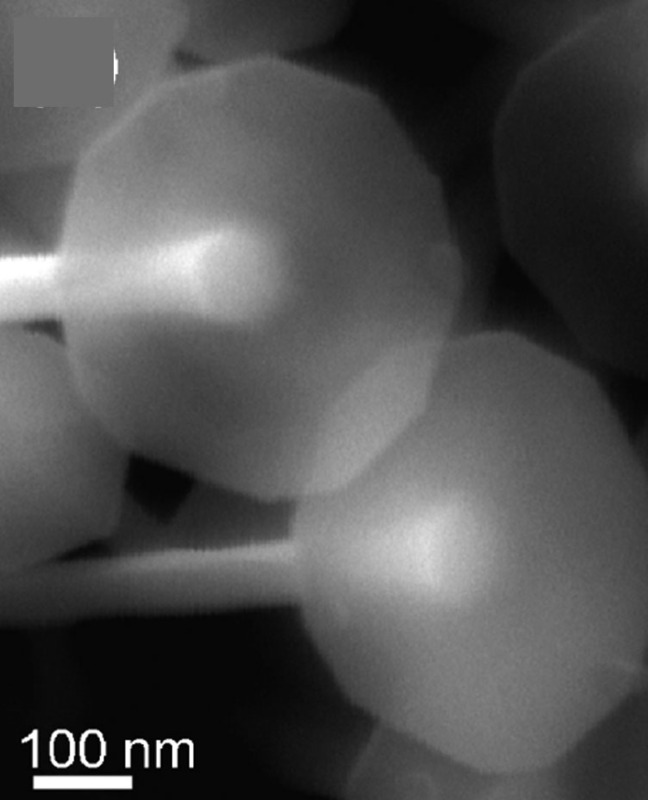 The team also investigated functionalising the metal nucleation surface to see if this enhanced crystal growth. 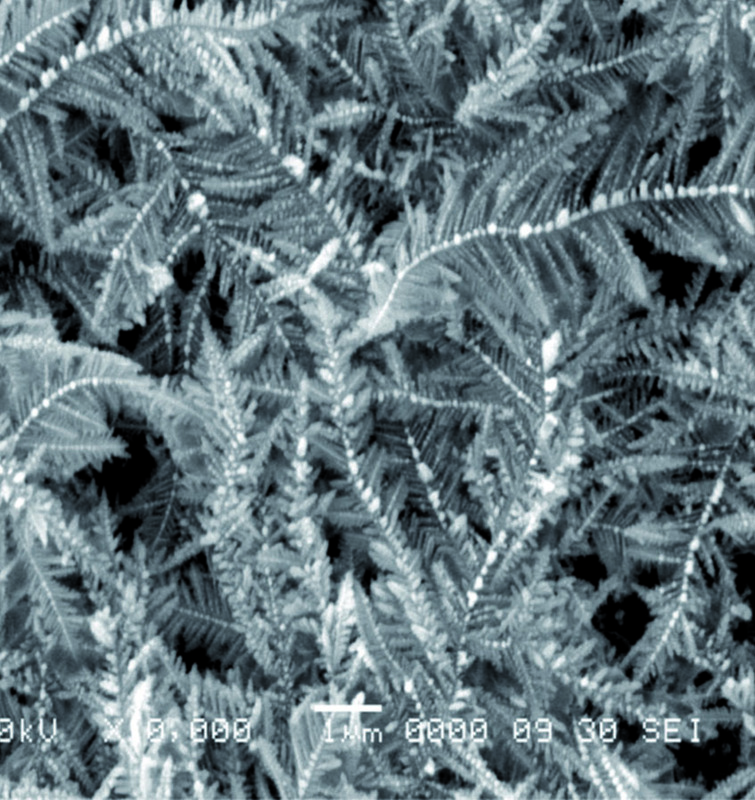 The image shown here is of the crystals created using bare silver island films and microwaves, the rest of the teams results, including full details of their growth process can be found in Issue 14 of CrystEngComm. With Euro 2012 now well under away this month’s crystal clear couldn’t be more apt – a crystal soccer ball. The paper, from Issue 12 of CrystEngComm, reports the generation of highly crystalline hollow whisker balls. Using the KCl flux cooling method, the team were able to grow highly crystalline K2Ti6O13 whiskers from the centres of titanium microspheres. The ultra-long whiskers grew on a TiO2 layer, leaving the centre of the sphere hollow and creating a bi-layer hollow whisker ball structure. 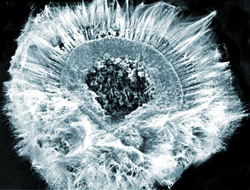 The team also used Ti powders as a starting material for the flux process and found this produced significantly different structures, for more details of the teams procedure and some remarkable images of their unique balls, download their article below for free. You are currently browsing the archives for the Crystal Clear category.